"2010 Maritime Person of the Year"
This picture was taken at the Gulf Coast Maritime Forum held in Mobile, AL on April 22nd, 2010. From left to right: the Admiral's female Mobile office Operations Manager, former U.S. Congressman Sonny Callahan from Mobile, and Captain Terry Gilbreath, Mobile Harbor Master. 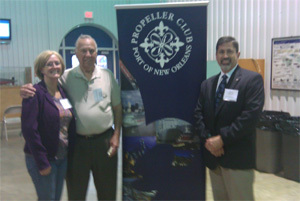 The banner was prominently displayed at the Mobile Propeller Club function.